1. Add ghee and salt to the wheat flour along with required water. 4. Add the ginger-garlic paste and stir-fry for 45 to 60 seconds. 5. Add grated onions, tomato paste, red chilli powder, cumin powder, coriander leaves and mint leaves. 6. Stir to mix well and add the mashed corn. 7. Cook for 3 minutes. 8. Add salt and stir well. 9. Make small balls of the chapati dough and press in the middle to make it like a cup. 10. Add some sweet corn mixture and close the edges. 11. Roll this into a thick chapati and place it on the pan. 12. Cook both sides adding required oil. 13. Remove and serve hot with side dish of choice. 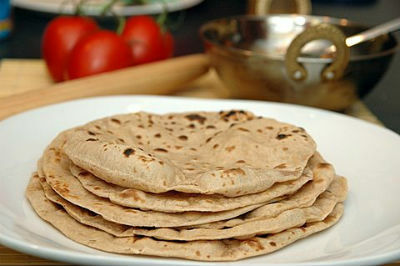 Feel free to comment or share your thoughts on this Sweet Corn Stuffed Chapati Recipe from Awesome Cuisine.